Enter your email on the right hand side of the page to be notified of workshops, plant sales, courses, open speaker sessions (always free), farm tours, farm dinners, and other opportunities. This calendar is updated frequently please check back often and follow us on Facebook– Thanks! Please SHARE this page with your networks. Internship and Apprentice Applications are accepted on a rolling basis. Please be in touch as soon as possible if you’d like to help on-farm with the 2016 season. The 2017 Nursery Skills Apprentice Program begins Friday, March 10- please email for details about this unique opportunity for immersion and hard-skills development in Pruning, Grafting, Propagating, and Production of Nursery Plants for sale. Design-Build Internship. From basic carpentry skills, site work, to computer aided drafting and design, solar power, waste-water recirculation, we have opportunities for you to learn! Interested in adding to your Natural Building Portfolio? We build beautiful, multi-purpose, farm-functional structures year-round, and are always happy to help you add to your skills. Permaculture Education Apprentices are interviewed for positions year-round. Herbal and Culinary Internships and Apprenticeships are available May-October. We are presently searching an Organic Vegetable (and/or Poultry) Production Manager or Partner. Do you want to learn some skills with carpentry, pruning, farming, forest gardening, irrigation, earthworks or masonry? Be in touch directly to arrange a mutually beneficial work day on the farm. Bare Root plant sales begin APRIL 22 and continue through early May. We have a variety of grafted Fruit Trees, Nut Trees, Nitrogen Fixers, and more! We will be scheduling a regular series of free farm tours from May- September TBA soon. Custom Scheduled and Private Tours are $100/ hour suggested donation, depending on group size and mission. Farm Tours for groups of school children and/ or senior centers are free, with a request for at least 3 months scheduling notice. 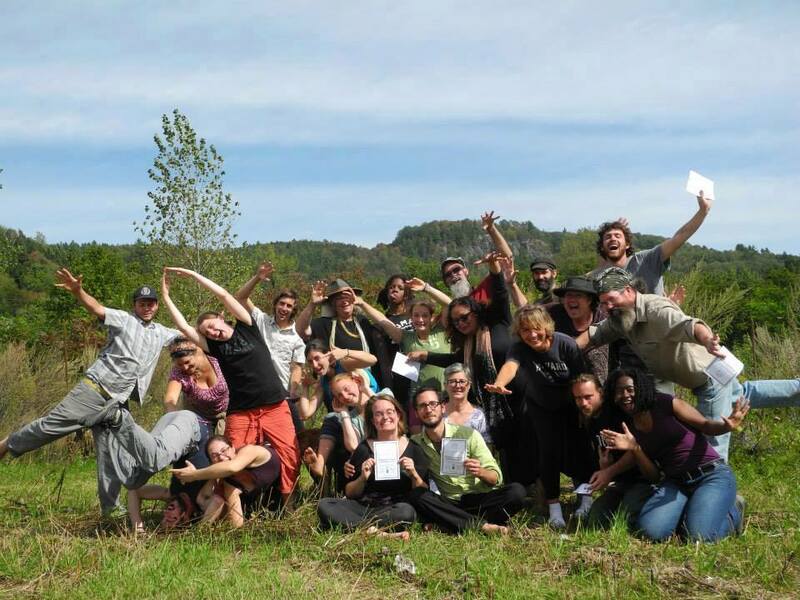 July 22- August 3: 10th Annual Permaculture Design Certification Course. Reserve your space now! This course is available for 5 credits through the University of Vermont and Eligible for VSAC Non-Degree Grants. WEEKEND FORMAT PERMACULTURE DESIGN COURSE! Details coming soon- please write with interest. Basement Retrofits – Root cellars and food storage can be retrofitted into most any existing basement providing easy access to crops in winter and a more an overall more affordable project. In this project we will retrofit an existing basement with super insulated walls, and doors and install venting and shelves for effective crop storage. Participants will use power tools, build and hang doors, fashion a passive venting system out of Pipe and fittings, and learn important factors for design and construction of a small family sized cellar in an existing victorian home basement in downtown Jeffersonville. Farm and Restaurant Coolbot Walkin Workshop. Below are events with links to PAST EVENTS which have some details. Please be in touch for custom workshops, retreats, or facilitated workspace for your group or organization. “Thinking Outside the Box” Alternative Beekeeping and Holistic Pollinator Support. The full calendar and details for our other offerings will be announced soon. We’re looking forward to offering: fruit tree grafting, nut production, diverse understory planting, spring development for gravity fed irrigation, natural building, compost heating, season extension, earth oven construction, natural beekeeping, and more. Our 2014 Permaculture Design Course will be held July 20-August 1, and is filling quickly. More details about our Advanced Permaculture Design Build Grow Teach internship positions will also be announced soon. Please be in touch for specific offerings and return soon as we update the calendar. We can also arrange custom-tailored workshops for you or your group at our farm or your site. Also- see the ‘Keynotes and Presentations‘ page for more formal presentations, lectures, etc. Earth Oven Building workshop with Mark Krawczyk and Sima Bode. Northeast Tree Crops Symposium at Willow Crossing Farm. April 18-19: Open Farm Tours and Work Party with UVM Permaculture Design Certification Courses- please email to join. May 30: Wild-Crafted Paints and Paint Brushes with Nick Neddo. June 6-7: Compost Toilet Design/ Build Workshop. Hands on with a house-attached ‘Gap Mountain Mouldering Privy’– led by Doug Clayton of Gap Mountain Permaculture. June 20- July 2: SMC Permaculture Design Certification Course. Open to the community! This course is available for 2 credits through Saint Michael’s College and Eligible for VSAC Non-Degree Grants. I must have misinterpreted the email on the date for the Fruit Grafting Workshop. I thought it was tommorow March 15th instead of Saturday the 17th. I typically work all day Saturday but I’m trying to get the time off. In either case I would like to stop by at least to check out the farm and the grafts. No worries. We should be doing another event in April (although at this rate we’ll be blooming already by then). Feel free to come by for the music, which starts at 7.